UK residents can buy Champix 0.5mg or 1mg tablets online through The Independent Pharmacy. Champix cannot be purchased over the counter, as it requires a prescription issued by a medical professional. Customers will be asked to complete an online consultation before ordering Champix tablets – this only takes a few minutes. 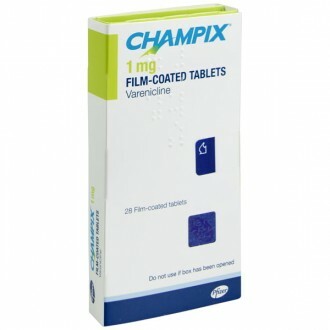 Champix tablets contain the active ingredient varenicline. Champix binds to nicotine receptors in the brain, meaning that cravings are reduced and smoking becomes less pleasurable due to the reward system being blocked. Champix has been shown to more than double your chances of quitting smoking for good. Champix tablets are taken twice daily, normally as a 12-week course. A quit date (where you stop smoking cigarettes) should be set 1-2 weeks after starting the medication to allow the dose to build up using the starter pack, before stopping smoking for good. The Champix Starter Pack (0.5mg & 1mg) should be used to initiate smoking cessation treatment before increasing the dose and switching to a course of Champix 1mg Tablets. Starting with the 0.5mg tablets and working up to the 1mg tablets reduces the chances of side effects and increases your chances of stopping smoking. Consuming alcohol while taking varenicline is thought to increase the risk of developing mood disorders or experiencing behavioural changes, therefore we would not recommend drinking while taking Champix. It can also compound the impact of any alcohol you do drink, making you feel more drunk than you really are. Some patients report experiencing strange, vivid or abnormal dreams after starting a course of Champix. This is a relatively common side effect, affecting approximately 1 in 10 of those who take it. If you find this happens to you and it becomes a problem, keep a note of how often the strange dreams occur and consult your doctor. Weight loss, on the other hand, is rarely a direct side effect of Champix. Some people find they have a decreased appetite while taking Champix, whereas others claim the opposite. It’s quite normal for people put on a small amount of weight after they quit smoking, as some look to satisfy cravings with food. When using Champix you must decide on a ‘Quit date’ where you will give up cigarettes completely. This should normally be between Day 8 and Day 14 of treatment, however it can be up to five weeks after starting treatment if you feel you are not ready to give up at an earlier date. Day 4 - 7: From day 4 to 7, you should take one white Champix 0.5 mg tablet twice daily, once in the morning and once in the evening, at about the same time each day. Day 8 until the end of treatment (end of Week 12): From day 8 (Quit date) to the end of treatment, you should take one light blue Champix 1 mg tablet twice daily, once in the morning and once in the evening, at about the same time each day. If you do experience side effects from Champix they may include gastro-intestinal disturbances, appetite changes, dry mouth, taste disturbance, headache, drowsiness, dizziness, sleep disorders, abnormal dreams. Champix has a small risk of nausea, vomiting, diarrhoea, and skin rash as with all medicines. Please read the Patient Information Leaflet enclosed with your medicines for a full list of side effects. If you experience any adverse effects from taking your prescribed medicine it is important to let us or your doctor know immediately. In a medical emergency you should contact the emergency services or go straight to your local Accident & Emergency. Chest discomfort, flu-like illness, fever, feeling weak or unwell. Each Champix tablet contains either varenicline 0.5mg or varenicline 1mg as the active ingredient depending on the strength. Each tablet also contains the following inactive ingredients: Cellulose, Microcrystalline, Calcium Hydrogen Phosphate Anhydrous Croscarmellose Sodium, Silica, Colloidal Anhydrous, Magnesium Stearate. The coating of Champix 0.5mg tablets contains: Hypromellose, Titanium dioxide (E171) Macrogols, Triacetin. The coating of Champix 1mg tablets contains: Hypromellose, Titanium dioxide (E171), Macrogols, Indigo Carmine Aluminium Lake (E132), Triacetin. Please read the Patient Information Leaflet enclosed with Champix before you take the medicine. Champix has been associated with depression and suicidal behaviour, especially in patients with existing depression. If you are taking Champix and experience a depressed mood, agitation or suicidal behaviour you should stop treatment immediately and see your doctor. Depression and agitation is commonly associated with quitting smoking whether you are taking Champix or not. If you experience any of these symptoms you should see your doctor as soon as possible. You should not take Champix if you suffer from epilepsy, seizures, heart or blood vessel problems unless under the supervision of your doctor. Champix does not guarantee success for those wishing to quit smoking, it still takes willpower to resist temptation and get out of old habits. However, studies have shown you can be up to twice as likely to quit when using Champix as those going ‘cold turkey’. Champix is normally a 12-week course of treatment, after which you should be a non-smoker. In some cases it may be necessary to continue for another 12 weeks after a discussion with the doctor or to taper down the dose slowly over a week. Stopping smoking can alter levels of different chemicals in your body, which can in turn alter how your medicines work. Eaxmples of medicines that will need to be closely monitored by your doctor whilst you quit smoking are theophylline (to treat breathing problems), warfarin (to reduce blood clotting), and insulin (to treat diabetes). Champix should not be taken during pregnancy and breastfeeding. Champix can cause side effects of drowsiness and dizziness. If affected you should not drive or operate machinery. Need to know more about Stop Smoking? Champix is a medicine containing varenicline and it is used to stop smoking and help with withdrawal cravings. It is available as a starter pack which contains 0.5mg and 1mg tablets and as 1mg tablets (continuation pack). Champix has been shown in clinical trials to increase the chances of smoking two to three fold versus going 'cold turkey'. Champix helps to reduce cravings or withdrawals as you quit smoking. Nicotine from smoking attaches itself to receptors in the brain. This releases dopamine and gives the euphoric feeling associated with smoking. Champix attaches to the same receptors and releases dopamine too. This stops any 'cold turkey' feeling or withdrawal associated when you stop smoking. Nicotine in the system is blocked from attaching to the receptors when the Champix is in place which reduces the large increases in dopamine usually released after a cigarette, hence reducing the reward. If you have not taken Champix before, you need to use the starter pack first. This will help you gradually increase the dose to the recommended daily amount of 1mg twice a day. The starter pack contains enough tablets for the first 4 weeks of treatment. A usual course of treatment of Champix is 12 weeks. This can be extended for another 12 weeks if you have been successful in the first 12 weeks. Chapmix has been shown to help 44% of people quit smoking after a full 12 week course. Day 1 to 3 - Take one 0.5mg white Champix tablet. Up to day 8 you can continue to smoke when you want to, however after day 8 you need to decide on a day to stop smoking. This can be up to 5 weeks after day 8 if need be. At the end of treatment when you have successfully stopped smoking, to reduce the chance of starting again it may be necessary to reduce or taper down the treatment to ensure you stay cigarette free. What’s the difference between Champix and other stop smoking treatments? There are lots of different methods to help you stop smoking for good. Nicotine Replacement Therapy (NRT) is available in different forms and these include gum, patches, nasal spray, sublingual tablets and sprays. It provides an alternative source of nicotine to help ease the withdrawal symptoms when you stop smoking. The frequency of use and dose is gradually reduced over time until it is not needed at all. NRT provides a source of nicotine without the other harmful chemicals and tar that is found in cigarettes. Often with NRT the nicotine takes longer to reach the brain compared with smoking and patients can find this difficult and discontinue treatment. The symptoms associated with withdrawal may be reduced with NRT but may not go away completely. There is always a temptation to start smoking again with NRT, however with Champix the receptors in the brain are blocked. This makes you more likely to succeed as even if you have a cigarette, the nicotine will not have an effect. Zyban (Bupropion) is another stop smoking treatment. It is an antidepressant that has also been shown to stop cravings and withdrawal associated when you stop smoking tobbacco. It doesn’t replace nicotine or block the receptors like NRT or Champix. Its mode of action is unknown but it is thought it affects chemicals in the brain. Bupropion has been shown to be less effective than Champix and is no longer recommended. Is it safe to use Champix continuously? The normal course of treatment for Champix is 12 weeks. This can be extended by another 12 weeks if necessary. We would not recommend using it continuously for longer than 24 weeks. The most common side effects of Champix include headache, nausea, difficulty in sleeping, abnormal dreams, and a sore throat or mouth. They affect approximately up to 10% of patients. Rarely, Champix has been associated with reports of suicidal thoughts or behaviour. After thorough clinical reviews of Champix in use it has been adivsed that Champix can worsen psychiatric symptoms in people with depression. If you experience any worsening of depression or suicidal thought or behaviour, stop using Champix immediately and see your doctor. How long will it take for Champix work? Champix takes approximately one week to build up and it take at least five weeks to see the full benefits. Take the missed Champix when you remember. If it is nearly time for the next dose, omit the missed tablet. Do not take two tablets together to make up for the missed one. Can I take Champix and drive? Champix does should not make you drowsy and should not affect your ability to drive or operate machinery. If you do feel drowsy after taking Champix you should not drive or operate machinery until it has passed. Can I take Champix during pregnancy and breastfeeding? Whilst it is important to stop smoking when you are pregnant or breast-feeding, it is not recommended to use Champix and you should consult your doctor to decide upon the most effective treatment plan for your condition. Can you smoke whilst taking Champix? Before you start Champix you need to decide a day to stop smoking. This is usually occurs at some point after eight days of taking the tablets. You can still smoke whilst taking the tablets until you decide you are ready to stop smoking. It is not unusual for the number of cigarettes you smoke to reduce daily as the tablet takes effect. You should not continue to smoke after five weeks of using Champix. Some patients that have used Champix to stop smoking have reported that they have feel depressed. Whether this is from the tablets or from stopping smoking is still unclear. If you feel depressed then we recommend you speak to us or your doctor to reassess your treatment. If necessary the tablets can be reduced from 1mg twice a day to 0.5mg a day if you are experiencing unwanted effects. Always ensure you stop taking Champix immediately if you experience worsening depression or suicidal thoughts or behaviour. There is a study which suggests that varenicline may have antidepressant-like properties. However, it wouldn’t be prescribed as a standard antidepressant, as it can also cause changes in behaviour, thoughts and mood, in addition to side effects like drowsiness. Does Champix increase blood pressure? People with any sort of cardiovascular disease will need to take extra care (and perhaps require monitoring) while taking Champix. Increased blood pressure and palpitations are a fairly uncommon side effect, but they can still happen. Champix shouldn’t be taken with any other form of nicotine replacement therapy, as this can lead to a sharp and potentially dangerous drop in blood pressure. Why does Champix cause nausea? One of the more common side effects of taking Chantix is nausea and vomiting. This varies from person to person – some people find it makes them feel sick, others find they do not feel nauseous at all. If it does occur, the nausea is usually mild to moderate and tends to fade with time.